Ireland's Sam Bennett produced a powerhouse finish to claim victory on stage three of Paris-Nice. 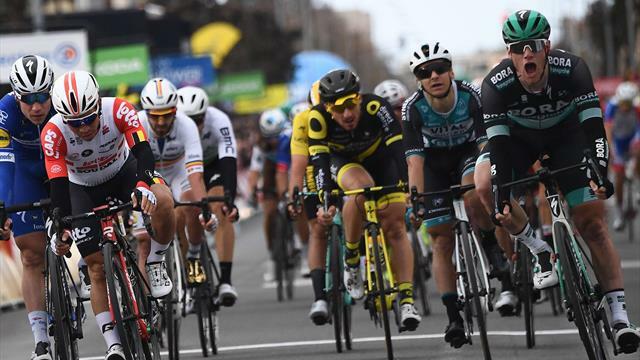 The Bora-Hansgrohe rider held off Caleb Ewan (Lotto-Soudal) with the Australian forced to accept second place despite a game effort to hunt down Bennett in the 200km flat stage. With race leader Dylan Groenewegen unable to maintain pace in the closing metres, Australian Ewan did manage to get on the back wheel off Bennett, but finished a bike length behind the stage three winner, who could hardly contain his glee at the finishing line. Fabio Jakobsen of Deceuninck-Quick-Step held off Dan McLay to finish third, but Groenewegen - winner of stage one and two - continues to lead overall by six seconds ahead of Team Sky's Michał Kwiatkowski . “I had really bad legs the last two days,” said Bennett. “I knew that the form was there and I had to just keep trying. “Today, the legs were a lot better — okay it was a lot easier. But I’m starting to get used to the cold weather. Today was my last sprint opportunity, and I did everything I could.". Bennett has claimed victories on the final stage of the Vuelta San Juan in Argentina and the UAE Tour in the past two months making this a treble in the opening three months of the year. “It’s nice to come back and to win again here. Strong competition here and last week [in the UAE]. I’m starting to show I can compete with the best. Stage 3 Cepoy to Moulins, 200 km. 2. Caleb Ewan (AUS) Lotto - Soudal "
3. Fabio Jakobsen (NED) Deceuninck - Quick-Step "
4. Daniel McLay (GBR) EF Education First "
5. Bryan Coquard (FRA) Vital Concept - B&B Hotels "
6. Niccolò Bonifazio (ITA) Direct Energie "
7. Alexander Kristoff (NOR) UAE Team Emirates "
8. Arnaud Démare (FRA) Groupama - FDJ "
9. Dylan Groenewegen (NED) Team Jumbo - Visma "
10. Edward Theuns (BEL) Trek - Segafredo "
11. Eduard Michael Grosu (ROU) Delko - Marseille - "
Mar 13-Stage 4 Vichy to Pélussin, 212 km, Road race. Mar 14-Stage 5 Barbentane to Barbentane, 25.5 km, Individual time trial. Mar 15-Stage 6 Peynier to Brignoles, 176.5 km, Road race. Mar 16-Stage 7 Nice to Col de Turini, 181.5 km, Road race. Mar 17-Stage 8 Nice to Nice, 110 km, Road race.